The NW Noggin program introduces youth to the structure and function of their own developing brains. Children are natural scientists and eager to learn, particularly when the material is relevant and creative and gives them insight into how their own brains work. And people are social, curious, and hoping to connect, so bringing together students fascinated by the brain and behavior at all levels of investigation leads to productive collaboration. Last summer, with welcome support from APS, we established NW Noggin. NW Noggin gathers graduates and undergraduates in psychology, neuroscience, and art from the Portland, Oregon, area to design and deliver their own multiweek programs on the brain and behavior for students in public schools. In metropolitan areas there are often several universities with research and education programs in neuroscience, along with public schools teaching science to students in kindergarten through 12th grade. Yet despite a strong shared interest, students in these separate programs and age groups rarely interact. There are many positive reasons to get them together. Sometimes graduate students are isolated because their institution lacks undergraduate programs, as in the case of Oregon Health & Science University (OHSU). This reduces opportunities to gain teaching experience and share work with a broader audience. It also diminishes competitiveness for jobs that require classroom expertise. 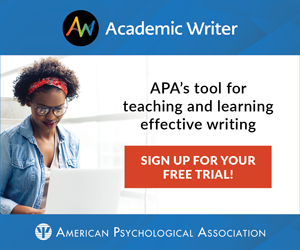 Undergraduates are often curious about further opportunities in psychology and neuroscience, including graduate options, which may be limited at their own school. They have questions about what research entails, what experience they need before applying to programs, and what studies are underway. Opportunities to learn directly from graduate students improve their appreciation of graduate options and directly expose them to students involved in funded research. Outreach also benefits undergraduates by reinforcing neuroscience concepts learned in class. In addition, studies suggest that in middle and high school, students are either excited or discouraged by science. Fostering enthusiasm for inquiry into the mechanics of the natural world can tip that balance. Efforts to reach a broader public about scientific discovery contribute to fascination, understanding, and support for research and education about behavior and the brain. Integrating art projects extends outreach further, as students create objects they can talk about with family and friends. 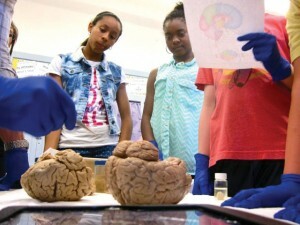 In the summer of 2012, I gathered a group of graduate and undergraduate volunteers who had studied together in advanced undergraduate neuroscience classes, which graduate students helped teach, and we developed a 4-week class on the brain for middle schoolers at a Northeast Portland public school. An artist, Jeff Leake, worked with us to create art projects to help convey concepts in neuroscience and extend our outreach efforts further. We partnered with the Immigrant & Refugee Community Organization, which manages the Schools Uniting Neighborhoods (SUN) Program at area public schools, and taught kids about neurons and networks, the visual system and perceptual illusions, brains and music, and other topics. In 2013, with APS support, we greatly expanded our efforts. We involved students from Portland State University, OHSU, Washington State University, and the Pacific Northwest College of Art, and we delivered new programs to middle schoolers at two public K‐8 schools. We also collaborated with SUN and the federal GEAR UP program, which offers educational enrichment for incoming high school freshmen identified as academically at-risk. Several Noggin participants taught at Madison High School and worked with 80 new 9th graders, introducing them to the structure and function of their own developing brains. We even visited the OHSU National Primate Research Center for an eye-­opening tour of facilities. Students heard from researchers working on animal models of multiple sclerosis, dementia, and obesity; witnessed primate behavior in action; and asked questions about animal experimentation, brain research, and potential career opportunities, too. In 2014 we are adding schools and plan further expansion into nearby Vancouver, Washington. We recently received support from the Regional Arts & Culture Council to further integrate art students and from the Portland Alcohol Research Center at OHSU to encourage graduate participation. Bill Griesar is an instructor in psychology and speech and hearing sciences at Portland State University, adjunct instructor in psychology and neuroscience at Washington State University Vancouver, and affiliate graduate faculty in behavioral neuroscience at Oregon Health & Science University.